As most of you probably know, I've been working for three years on a book on FDR and US entry into the Second World War, and I've read a great many of his speeches. They have a simple clarity that very few contemporary politicians can equal. In addition, Roosevelt never feels compelled to apologize for anything he is saying or doing, since he is so convinced that it is the logical step to take--something that certainly distinguishes him from Barack Obama. So I'm now going to take a stab at how Roosevelt would discuss the current crisis. It won't be perfect--I'm not actually going to refer back to his speeches--but I hope I can both convey some of his characteristic tone, and, more importantly, do what he would have done and make clear some critical facts. "For the past few months, the Congress has been locked in struggles over raising the federal debt ceiling. That ceiling is now pegged at $14.3 trillion dollars and the government will not be able to continue operating if it is not raised. The Republican Party claims that we cannot afford it; that we must make massive cuts in federal government programs to stop or slow its growth; and even, in some cases, that we should simply let the government default on its obligations. In any storm at sea, some people are likely to lose their heads. I speak to you tonight to explain that while our economic problems are very real, our debt problems are in fact quite manageable. Here is why. "The figure of $14.3 trillion seems daunting because it is rather close to our current estimated GDP. That is not unprecedented: in 1945, at the end of the last great crisis in our national life, our accumulated debt was considerably in excess of our GDP. That did not prevent the United States from converting from a wartime to a civilian economy and launching an era of unprecedented prosperity that lasted for several decades. There is in fact, as I shall now explain, no reason why we cannot do the same, if we see things clearly, discount counsels of fear, and take appropriate action. "Yes, officially, the government owes $14.3 trillion--but in fact, it only needs actively to service about half that sum. Let me explain by breaking down the debt based upon whom it is owed to. $3.6 trillion of the debt is owed to you, the American people, who have wisely entrusted your savings, directly or indirectly, to the government's care. There was no reason not to do so: the 14th amendment to the Constitution, adopted at another moment at which the public debt was at an all-time high, guarantees it for all time. And indeed, as many of you know, the return on Treasury bills has compared very favorably with other assets during the last few years, because of the world's confidence in our economy. 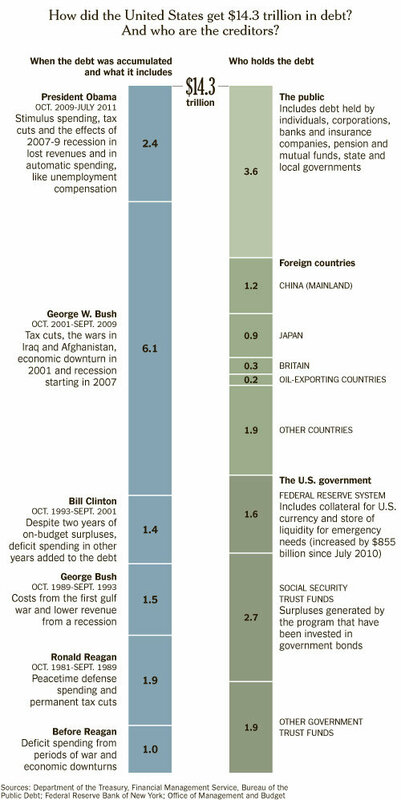 "That, in turn, is why an even larger portion of the debt--$4.5 trillion--is held by foreign nations. They have shown no haste to unload it despite our economic crisis. This debt is the inevitable consequence of our trade deficit: since we import so much more than we export, we can only pay for the imports by borrowing either at home or abroad. But we have had no trouble doing so for decades and there is no reason why we cannot continue doing so in the future, even though there are very good and sound reasons for us to want to stop shifting production overseas and improve our trade balance. "Simple addition will have already told many of you that our combined domestic and foreign debt, then, totals $8.1 trillion, $3.6 trillion at home and $4.5 trillion abroad. Yet the official figure for the debt is $14.3 trillion. Where, you are undoubtedly asking, can that come from? To whom can we possibly owe the additional $6.2 trillion? "The answer, my friends, is that we owe it to ourselves--and, if we now take some simple, necessary and equitable fiscal steps, we will not need to worry about it very much. "To begin with, $1.6 billion of the debt is held by the Federal Reserve Bank--part of their reserves. As you all know, the Federal Reserve is dedicated to the maintenance of a strong U.S. economy and currency. It is never going to use its holdings of U.S. debt to try to bring down the government of the United States. "The remainder of the debt--$4.6 trillion--is owed to trust funds of the federal government itself. Of that sum, more than half--$2.2 trillion--is in the Social Security Trust fund. We are now entering into some complicated accounting by ways, but they are easy enough to follow, particularly if we begin with a little history of the modern Social Security system. "In 1972, President Richard Nixon and the Congress raised social security benefits substantially. In the early 1980s it was clear that these benefits would be hard to afford several decades down the road, when the Boom generation retired, and President Reagan and a Democratic Congress led by Speaker Tip O'Neill reached an agreement to raise Social Security taxes. Indeed--and this is the key point--they raised the payroll tax, shared equally between employers and employees--well beyond the level that was needed at that time to pay the Social Security benefits that the government currently owed. Some had expected that the surplus payroll taxes would actually be saved, but that was not what happened: they went into the federal treasury and were spent to help cover the very large deficits that resulted from President Reagan's economic policies. In exchange, special non-negotiable government bonds were deposited in the Social Security Trust fund. Those were claims on the federal government to pay future benefits. For as long as payroll taxes sufficed to cover benefits, however, it was not necessary to make good on those obligations. "Even now, payroll tax receipts remain barely adequate to cover Social Security benefits. That situation is indeed about to change as the Boom generation retires. If however we can make appropriate adjustments to the payroll tax, and perhaps slow the annual rate at which benefits increase, we can quite easily afford benefits out of current revenues indefinitely. The easiest adjustment, which I have proposed, is to end the payroll tax exemption on incomes of more than $106,800 a year. Because of that exemption, social security taxes take up a far smaller percentage of the income of wealthier Americans than they do of those in among the poor and middle classes. There is no reason for this to continue. If we make these changes social security benefits will continue without the government having to pay off any of the bonds held by the Social Security trust fund. "I have been talking about the problem of the Social Security trust fund, which now accounts for $2.7 trillion of the federal debt because payroll taxes have exceeded expenditures for the last 28 years. The situation in other trust funds is similar: they represent the excess of revenues over expenditures dedicated to certain federal programs, including highways. So long as we adjust revenues for those funds so as to cover current expenditures as well, we will not have to spend current income to require the debt that they hold either. "And thus, the situation is very different from that of 1945, when our total public debt was not only larger relative to our Gross Domestic Product than it is today, but when it was composed almost entirely of real obligations to private persons or institutions, not trust funds. I would suggest that in real terms, we are twice as well off as we were then. We can easily continue refunding and servicing our current debt and even allow it to increase during the economic crisis. Indeed, in order to get out of the economic crisis, that is what we have to do. "Our biggest problem today is not debt: it is jobs. You know it better than I. We need, once again, to put people to work. We also have plenty of work for them to do: the repairing and improvement of our nation's infrastructure. Many of our roads and bridges are in a deplorable state. High-speed rail, which is playing an important role in the economies of both Europe and Asia, has not yet even got a foothold in the United States. We have barely begun building a new generation of automobiles. Our power grid needs work. None of this should be in the least discouraging: it should be inspiring. It gives us, and especially the young people of America, a task worthy of ourselves, a task equal to the great work accomplished by earlier generations. "Sadly, the Republican Party has for thirty years been engaged in an intermittent crusade to reduce, if not destroy, effective government in the United States. For many years their leaders appeared to recognize that much of their rhetoric was excessive and could not be reconciled with sound policy. Both Ronald Reagan and George H. W. Bush bit the bullet when necessary and raised taxes--not always fairly it must be said--in order to reduce huge deficits. Now, however, sadly, the party of Lincoln, Eisenhower and Reagan has lost its bearings. It would return us to the days of the late 19th century, when millions lived in poverty, when health care and public services were shamefully inadequate, and when corporations and monopolies ruled our society. The American people are too smart to follow them down that road. "The debt crisis which the Republican Party, particularly in the House of Representatives, is trying to use to undo the work of the last century is largely illusory. We have more than adequate resources to pay the debt. 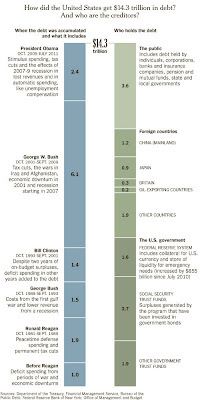 When we allow the Bush II tax cuts to expire and all Americans start paying a bit more for the government much of the deficit will disappear. More will disappear with the end of the wars in Iraq and Afghanistan. Meanwhile, our plan to rebuild America will make a dent in the unconscionable unemployment that is the real threat to our well-being. During my European trip I passed through Heathrow airport twice. At one of the departure gates there was rack of free magazines, and the only one from the United States was The American Spectator, a venerable conservative rag of intellectual pretensions, featuring articles by editor R. Emmett Tryrrell, Jr., Ron Chernow, and Grover Norquist, among many othrs. Tyrrell proclaimed "Liberalism's Death Croak," George Gilder explained that Israeli settlments were the best thing that had ever happened to the Palestinian economy, and Joseph Shattan gave a glowing review to a book of essays by Irving Kristol, founder of neoconservatism. But the articles that really caught my eye were about Europe: a "Letter from Paris" by Joseph Harriss, and "The Rebirth of Nations" by Roger Scruton. As regular readers know, I generally reject comparisons between Fascists and American conservatives because I believe their goals are so different. This one, however, hit me in the face. Harriss' article, "The Power of Le Pen", was a paean of praise for the French National Front. Scruton went further, lauding all the neo-Fascist European parties trying to ride into power on a wave of nationalism and anti-Muslim incitement. The reason for these rather troubling positions became apparent within the articles: these parties, first, are obsessed with the Islamic danger in Europe, but more importantly, they generally oppose the European Union, which has become a secular socialist bugaboo for the American right. One might have though, of course, that the twentieth century examples of Italian and German exceptionalism might have made Americans shy away from the idea of American exceptionalism, but the reverse, of course, is true. The European Union represents the most complete triumph of Enlightenment ideals in the world today, including the ideal of the perfectability of society with the help of a strong government, and thus to American conservatives it must be a bad thing. Today's American conservatives also seem to be well aware that the leaders of the European right, like Nicolas Sarkoczy, David Cameron, and Angela Merkel, are all considerably to the left of Nelson Rockefeller in their policies, and thus, if they want to find European allies, they must look further right. The Anmerican Spectator was of course only one data point, but it was clear that rejection of the European union and praise for European nationalist movements are now part of its line. How widespread these views are among rightwing publications I do not know, but I found them very disturbing. I have been most gratified to note that this blog now has a very noticeable readership in France--266 hits in the last week or so, for instance--and I would be very curious to hear comments from any French readers. Meanwhile, see another post from yesterday, below. The scenario forecast by a Congressional staffer whose interview I linked near the end of last week's post seems to be coming true. The House Republicans have become more and more detached from reality and have refused to let their Speaker agree to any tax increases as part of a compromise. Nor does it seem at all likely that they will accept the McConnell plan to allow President Obama to raise the debt ceiling for the next 18 months while they scream helplessly from the sidelines. Unable to get what they want--massive spending cuts without any tax increases--they seem likely to force the United States into default. In an interesting generational milestone, Silent George Will in yesterday's Washington Post praised the Tea Party to the skies as a transformative, revolutionary force in American politics, while begging their handmaidens in Congress to compromise now, hold off until the next election, and complete their miraculous transformation of the country under a Republican President. Will's conversion to lunacy is certainly remarkable, but he was probably trying to head of catastrophe in the only way he could think of. It may not be necessary to actually reach default, simply because the news of the weekend may be enough to send world markets into a gigantic tailspin on Monday. If not, the tailspin will be delayed until we pass the August 2 deadline. I tend to assume that the tailspin will not produce a repeat of 2008, since the balance sheets of financial institutions are now accepted as sound, and that it will be corrected when some kind of a deal is struck within another week. But I cannot be sure of that. Meanwhile, it is clear that the right wing has unleashed a new propaganda offensive in cyberspace. Various indicators show that the circulation of the fraudulent email attributed to me comparing Obama to Hitler is spiking again. It will surely spike yet again a year from this fall. The Obama Administration has essentially been the third Clinton Administration, and it seems to be counting on a replay of 1995-6, when the brief government shutdown saved the Clinton presidency and led to his re-election. President Obama has indeed positioned himself as the rational, mature, neutral elder statesman in the crisis, and he has won some points in public opinion surveys as a result. Yet there remains one overwhelming difference between 1996 and 2011. In 1996 we were in the early stages of an economic expansion that lasted the whole of the Clinton presidency. In 2011 we are sunk in something very like a depression and there is no sign of a real recovery. And I am increasingly fearful that that will do the Obama Administration in. It has been a fantasy both of liberals and political consultants like James Carville that Obama won in 2008 because of a profound demographic shift that would keep the Democrats in power for a long time. The new Millennial generation is very liberal socially and, they thought, politically. It gave Obama his biggest majority. But it turns out that their loyalty--surprise, surprise--depended on his response to the economic crisis, and that response has failed to reverse the economic decline. He has offered just as little way out of our crisis as Herbert Hoover, and it seems increasingly likely that he may pay the ultimate price for that no matter who the Republican candidate is. Even in the best case--a deal, without a market crash--the country will continue going backwards. We need more spending and more taxes; we will get less of each. President Obama does in fact have one more card he could play. After the ceiling is raised--after, that is, it is raised beyond the next election--he could announce that he will not sign any bill extending the Bush tax cuts further. We need more revenue, he could say--perfectly truthfully--and this is evidently the only way to get it. That would be good policy and conceivably, good politics. Everything we have seen about him so far, however, suggests that that will not happen. Welcome to the new Gilded Age. I'll have another post tomorrow. From time to time, I have had conversations over the last few years with a friend of mine, a historian of Weimar Germany, comparing our situation to theirs. We haven't talked for a couple of months, but a new and unmistakable parallel has emerged. It suggests that our domestic crisis is far from over, and it does not bode well for the short-term future of American democracy. The designers of the Weimar Republic were sincere democrats who took various elements of their constitution from existing Republics. They decided on proportional representation for the Reichstag, the parliament, which probably gave an advantage to extreme parties whose support was scattered around the country. They also created a strong President elected by the popular vote, and even gave him emergency powers to carry on the essential functions of government should the legislature fail to agree. In so doing they followed a precedent from German history: Otto von Bismarck, as Prime Minister of Prussia, had successfully exercised such powers from 1861 until 1867, governing with the existing budget when Parliament refused to pass a new one. There is of course no such provision for emergency powers in either the unwritten British or the American Constitutions. The federal government can neither spend nor borrow money without an explicit authorization from the Congress. This is as good a place as any for me to introduce a new element into the budget discussion: as far as I can tell, the United States is not in the least threatened with default if Congress does not act by August 2. The US Government is currently authorized to carry a debt of a certain amount--checking I find it is apparently $14.294 trillion--and I assume that that authorization is indefinite. Thus, even after August 2, the government would be able to borrow money every time an existing obligation came due, since that would not increase the overall debt. But it would not be able to borrow more money to make additional expenditures. Given the size of the government deficit, that is, the amount of current government expenditures not covered by revenues, that would indeed be catastrophic for government and the American people, but it would not be a default. If the Republicans really meant what they are saying they might in fact argue that the government's job is to start balancing its revenues and expenditures on August 3, but of course they haven't. But back to the topic. The Weimar Constitution required a strong, sincerely republican president to function effectively, and German voters initially elected just such a man, Friedrich Ebert, a social democrat. Tragically, however, he died in 1925 at the age of 54, and in a close election German voters replaced him with the right wing candidate, Field Marshall Paul von Hindenburg, who did not believe in the Republic at all (and in fact asked the deposed Emperor William II for permission to run for this illegitimate office.) But as late as 1928, the Weimar government was firmly in the hands of a center-left coalition, led by another Social Democrat, Hermann Muller. That government fell in 1930 and the new Chancellor, Heinrich Bruening, called for new elections. They catastrophically increased the power of the Nazis and the Communists and made it impossible for any government to command a Reichstag majority for the rest of the Weimar Republic's short life. For the next two years, all budgets were passed under Article 48 of the Weimar Constitution, providing for emergency presidential decrees. Bruening for two years cut the budget in the midst of a depression, making it worse, increasing the Nazi vote, and paving the way for the final catastrophe. The Nazis and Communists refused to take responsibility for governing their nation. The Republicans have been doing the same, insisting on absolutely impossible conditions before increasing the debt limit and allowing the government to function, because their House majority refuses to vote for anything that violates their principles of budget-cutting and no new taxes. Their policies, particularly the Paul Ryan budget, would return us to something like the Gilded Age once and for all. Some of them evidently would be glad to stop government borrowing right now, and they may indeed prevail over the next two weeks, although I think that is unlikely. But Mitch McConnell--who like Joe Biden belongs, barely, to the Silent Generation (b. 1942)--has lost his nerve, and I think John Boehner has as well, although he is still putting up a brave front. McConnell has come forward with a proposal designed in effect to turn the United States into something similar to the Weimar Republic in 1931-2, that is, to give the President emergency powers to deprive Congress, which refuses to do its job, of one of its most essential functions. McConnell apparently is willing to give the President the authority to raise the debt ceiling himself, subject only to approval of one-third of each house. That will allow the government to continue to function while leaving every single Republican in Congress free to vote against what is happening. It is surely unconstitutional--I do not believe the Congress is free to abdicate its powers, although it has done so on several occasions recently already. It illustrates the inability of the majority that Fox News and Clear Channel have brought into being to face reality and be honest with themselves about the necessary role of the federal government and the need to pay for it. It also illustrates the incredible power of Grover Norquist, an unelected official who has never held any government office who can single-handedly prevent tax increases which we desperately need. The McConnell compromise no looks like the most likely solution to the crisis. President Obama yesterday signally failed to insist on a broader deal. It will allow our government to function, but it will also confirm that our democracy, like Weimar after 1930, isn't functioning at all. One reason the United States is in such trouble today is that its Boomer and Xer politicians have no respect for established traditions or laws. They care only about pleasing their backers and their constituents. It may turn out that some genuine reverence for our Constitution--something that history departments and law schools have also more or less stopped teaching--is necessary to make it work. What happened in Weimar? In 1932 Hindenburg was barely re-elected running against Hitler. (He had now become the candidate of the Left, since he seemed to be the only man who could defeat the Nazi leader.) But as the economic crisis got worse and worse because of budget austerity, he was eventually persuaded to appoint Hitler Chancellor as head of a center-right coalition in January 1933. Hitler immediately claimed various emergency powers of his own and within a few months had convinced the Reichstag to vote itself out of existence. I have argued before, and still believe, that today's Republicans have essentially noting in common with the Nazis from a policy point of view, even though many of their rhetorical tactics are very similar. The Nazis wanted big government and a strong state; the Republicans are moving as quickly as they can to destroy our state and federal governments. But the Republicans, like the Nazis, have scored a big enough electoral triumph thanks to the economic crisis to make the country ungovernable by traditional means. In addition--and this may turn out to be the critical point--they have moved the political debate catastrophically to the right. In the midst of the second-worst economic crisis in our history we are not arguing about whether to cut the budget, but about how much to cut it. Both the federal government and virtually every state government in America are taking steps that will make the economic situation worse, and President Obama will pay for that at the polls next year. The only question is--how much? Politically Obama has been rather clever in trying to seize the center over the last few months, and he has won centrist pundits like David Brooks over to his side. If he could secure his grand bargain to include some (although not nearly enough) tax increases and entitlement cuts, he could actually bring the current crisis to an end, and that obviously is what he would like to do. The Republicans, however, are determined not to let him. They will neither give up their policies which will make the economy worse, nor give up their right to blame the President for everything. (This very interesting interview with a Congressional budget staffer strongly suggests that there will be no deal before August 2 for the reasons that I just cited. It's a rare glimpse into the inside of the Republican Party right now and I recommend it very highly.) Whether that works depends on what happens to the economy and I am afraid that it may actually get worse. If it does, we may indeed find ourselves in January 2013 with President Romney or Bachmann or Perry in the White House and Republican majorities in both houses. That will mean the dismantling of the entire modern government of the United States, further economic catastrophe, and a very uncertain political future. It was a year ago, on July 5, 2010, that I suggested that this crisis might well have started on September 11, 2001, that it might be nearing its end, and that it would not involve any regeneracy comparable to what the United States experienced during the Depression and the Second World War. A great deal has happened since then, including the Republican Congressional victory, the new war in Libya, the interruption of economic recovery, and the threatened debt crisis. In my opinion, as I plan to show today, most of what has happened suggested that I was right--but there are also possibilities looming on the horizon pointing in a different, and, sadly, even less inspiring direction. The view I enunciated then, it is now clear, is most definitely shared by the President of the United States--but while I regretted the end of the crisis and the lack of any real regeneracy, he seems to be embracing it. Barack Obama is of course a Gen Xer, a Nomad in Strauss-Howe terminology, not a Boomer, or a Prophet like Lincoln (Transcendental) or FDR (Missionary.) And although he was born in the first year of JFK's presidency, he evidently dreams of emulating his fellow Nomad, Dwight D. Eisenhower. Just as Eisenhower accepted (sometimes reluctantly) the reforms of the New Deal and even the very high tax rates it bequeathed to the nation, Obama has not challenged the economic deregulation that has been going on for thirty years and reached a climax under George W. Bush. Like Eisenhower, he has embraced the (somewhat less sweeping) new foreign policy commitments that his predecessor made. (It is one thing, however, to embrace NATO, as Eisenhower did, and a completely different thing to embrace an indefinite American presence in the heart of the Muslim world.) The centerpiece phrase of Obama's State of the Union address--the "Sputnik moment"--was a clear reference to the late 1950s. The Obama Administration is playing roughly the same role in the gay rights revolution that the Eisenhower Administration played in the civil rights revolution. Nowhere, however, is Obama's affinity with Ike more obvious than in the debt reduction negotiations now taking place. Both Eisenhower and Obama began their terms with majorities in Congress and lost them in their first mid-term election. (Obama, unlike Ike, still has a Senate majority, but given the evolution of Senate customs it is not big enough to accomplish anything.) And both have reacted by accommodating the opposition leadership to an extraordinary extent. Obama is more than happy to cut tens of billions of dollars in federal discretionary spending, putting more people out of work, and is even willing to discuss reductions in Medicare, Medicaid, and Social Security benefits. He wants to use the threat of a debt crisis to forge a grand compromise, a new consensus, which will firmly establish him as a strong leader and lay the partisanship of the last forty years to rest. And just as Eisenhower evidently realized that the New Deal was here to stay, Obama does not seem to care that that grand compromise would continue to promote income inequality and leave the United States with numbers of permanently unemployed comparable to the latter stages of the Great Depression. Can he do it? There are two threats, one political and one economic. Republican columnist David Brooks obviously wants Obama to bring this off, and last week he criticized Congressional Republicans for not meeting the President half way. But the Republican Party has just won a smashing Congressional victory by portraying Barack Obama as a political Antichrist for two years. Taking their cue from Rush Limbaugh, they have blamed everything on him and his supposed liberal allies. (Liberals, meanwhile, are finding out, as conservative Republicans did under Ike, that Obama is not much of an ally at all. I received an email from one of my Senators this week complaining, in effect, that the President was considering Social Security and Medicare cuts.) Although John Boehner seems tempted by the possibility of emulating 1950s House Speaker Sam Rayburn, Mitch McConnell shows no sign of wanting to be the new LBJ. (Just those comparisons show how far we have sunk.) The last thing the Republicans want is to announce that they have solved the country's problems with the help of Barack Obama. Boehner's reaction to yesterday's wretched jobs news suggests that the bad economy makes a deal less likely, because he and his troops think they have Obama on the run. I do not think, however, that the Republicans will actually dare to plunge the country into default for more than a few days. Thus we will see a series of stopgap compromises, including a catastrophic agreement to continue the cut in the social security payroll tax that Larry Summers evidently talked Obama into before he left--really one of the stupidest moves by a Democratic President in my lifetime, since it is hastening a genuine crisis in social security payments. There will be no great compromise unless Obama is re-elected, holds the Senate and makes some gains in the House. (He is not going to win a majority back there.) And it is far from clear, given the state of the economy, that that will happen. In either case the United States's decline is going to continue. We have not got the political will or the intellectual capital to attack our real problems, including long-term job losses, the power of the energy, food, and drug industries, and the cost of health care. Some left-wingers are indeed hoping that things will get so much worse that a stronger left-wing response will be necessary. I do not share those hopes. To begin with, there simply isn't any strong organized left ready to assume leadership. We have not elected a truly liberal President on domestic issues since Lyndon Johnson. The Democratic Party may have worse relations with Wall Street and the energy industry than the Republicans but it is not offering a real policy alternative. The right is at least as likely to benefit from a further economic deterioration as the Left. Make no mistake: the stronger the Republicans get, the worse the economy will get. I learned in my teens and twenties that today's Republican policies made the depression worse both in Germany and the United States. In Germany they brought Hitler into power; here they brought in FDR. We have no Hitler, but we also have no FDR. Our economy is going to stagnate for a very long time. Our interest is to have it do so at the highest level of employment possible, and I think the grand compromise probably would be, on balance, a good thing. John LeCarre will be 80 years old later this year. He made his name at the height of the Cold War with the extraordinary and relatively short and gripping thriller, The Spy Who Came in From the Cold, whose denouement so thoroughly shocked me, at the age of 17, that it took me about fifteen minutes to realize what the book had actually said. The hero of the book, British spy Alec Leamas, was so shattered by the personal betrayal he experienced for the greater good that he effectively gave up his own life, as well as the Cold War, at the end. In the flush of youth I concluded that although Leamas was worn out, LeCarre was telling us that the broader struggle had to go on. It was about twenty years later that I realized the real point of the book, as well as of the whole Smiley series: that the intelligence battle between "the Circus" and the KGB, and perhaps the broader Cold War as well, was of very little interest to anyone other than its practitioners; that the Cold War was, in a sense, a fraud. LeCarre's books remained hymns of praise to rare men of integrity such as George Smiley. When Le Carre published A Perfect Spy in the 1980s and explained that the protagonist's criminally irresponsible father was a portrait of his own, I realized that Smiley--of the Second World War generation himself--was probably the father LeCarre would have liked to have had. The end of the Cold War started a professional crisis for LeCarre. He had already detoured into the Middle East, angering Zionists like Norman Podhoretz, in The Little Drummer Girl,, but now he had either to write about the past or expand his horizons. He has quite successfully done the latter and he has not shrunk from what he has found. In the last ten years he has emerged as a violent critic of recent American foreign policy and of the "war on terror," and Our Kind of Traitor is a devastating commentary on contemporary Britain, which seems in his telling to be little if at all better off in its political culture than the United States. I shall not detail the plot of the new book, which turns on the attempted defection of the leading money-launderer of the Russian mafia. His character is colorful but not inspiring. The protagonists are a young pair of British idealists, the woman a barrister, the man a successful Oxbridge academic who has (appropriately enough) become disillusioned with his profession. (LeCarre does not go into that very deeply, but take it from me,there's plenty to be disillusioned about.) The Smiley figure is a British Boomer named Hector, another man with a conscience who recently took a kind of leave from "the Service" to fight off a corporate raider's takeover of a family firm that would have done away with several hundred well-paying jobs. What Hector discovers, however, is that the Russian Mafia has managed to buy extraordinary influence in British financial, economic and political circles, and that, in the end, its allies are quite strong enough to prevent anything from happening that might jeopardize this valuable alliance. The book is obviously carefully researched, and indeed I suspect that a savvy British observer might be able to put real names on some of its characters. The power of Russian oligarchs and Russian money--as well as Mideast oil money--was brought home to me in striking fashion early this year, when Dubai and Russia were awarded the 2018 and 2022 World Cups. Brazil will deservedly host in 2014: they are both the greatest soccer nation on earth, and a rising third world economic and political power. Dubai has no soccer tradition worth mentioning and will be a disastrous place to play--they won, presumably, with promises of money--money for FIFA, the international soccer federation, whether or not they actually bought votes. Russia has some soccer tradition--although even the Soviet Union's national team never, as I recall, managed to reach the semi-finals of a World Cup--but its political and economic life are a disgrace, and its prestige simply did not deserve this boost. In our world, however, money talks. And that, sadly, is the real legacy of the end of the Cold War. It was not "the end of history" in a utopian sense, but rather, as it turns out, the end (for the time being) of history as a struggle among competing world principles. In the first half of the twentieth century, Fascism, Nazism, and Communism had helped move the United States, Western Europe and Japan to create genuinely more just societies, organized in many ways around the common good. Now that no longer strikes us as necessary. Britain and the United States are both on the verge of dismantling their welfare states. The whole western political world has failed to respond effectively to the excessive financial power of the banks, even in the wake of the world crisis. All over the world, practically, inequality is reaching heights not dreamed of for about a century. Only further and greater catastrophes seem likely to bring this process to an end. I have never met LeCarre, much as I would like to, but his almost complete inability to find anything hopeful on the contemporary scene suggests to me that he would understand that last paragraph very well. Hector, the older hero of this book, is fighting a losing battle for civic virtue. Perry and Gail, his young heroes, are looking for a worthy cause. (They may return in later novels.) But LeCarre, like his contemporary George Soros, has been disappointed by the events of his old age. I can't blame him. Perhaps he, like me, now has more respect for our parents' and grandparents' generations, who did indeed leave behind something of a heroic tradition for his generation, and mine, to squander. p.s. A regular reader has just provided this link to a long interview with LeCarre discussing aspects of the state of the world.